Fire up the grill because it’s martini time! Are you a little surprised by that statement? Honestly, I would have been too. Grilling is something I never thought would be a part of a cocktail. The adventurous path of cooking took me to a whole new place. Now that I’ve visited it, I know I’ll be returning often. Let the experiments begin! But first, I had to share this recipe for Grilled Lemon Cherry Drop Martini. How did this adventure get started? My friend Terry gave me a stack of magazines. They sat on my coffee table for the longest time. Then one day I decided to browse through them. I came across a tip about charring lemons in a cast iron skillet in one of the issues of Bon Appetit. It was intriguing and interesting. I cut out the page and set it aside to save for later. 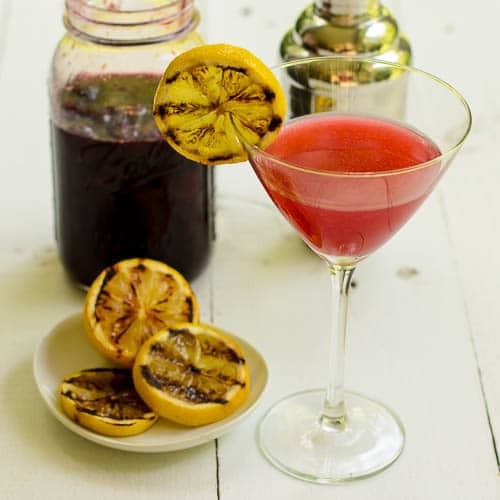 Grilled Lemon Cherry Drop Martini is a twist on a classic Lemon Drop. Grilling lemons intensifies the flavor. It also intensifies the tartness of a regular lemon and brings out more sweetness in a Meyer lemon. I used regular lemons and this martini will make you pucker. Cherry syrup does sweeten it a little and gives it a lovely color. There is a slight smoky flavor and a hint of bitterness from the charred part of the lemon and olive oil (brushed on before grilling). Think of it as like adding a dash bitters to a cocktail. Have you ever grilled lemons? It’s a first for me and it won’t be the last. I can see sipping on this martini while manning the grill for Chimichurri Skirt Steak or Sweet Tea Brined Pork Tenderloin. I still have more cherries and there is a cake in the works. Stay tuned for that recipe and more. Cheers! 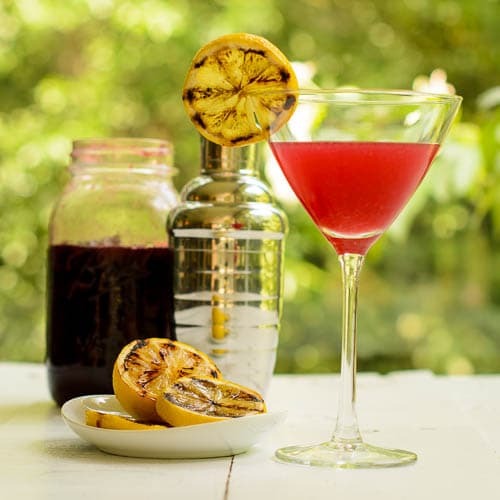 A recipe for Grilled Lemon Cherry Drop Martini. 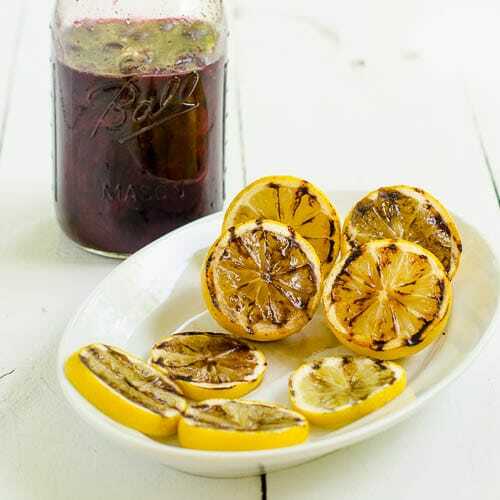 Lemons are grilled to enhance the flavor then the juice is shaken with vodka, cherry syrup, and ice. Heat grill to medium-high. Cut lemons in half and brush cut sides with olive oil. 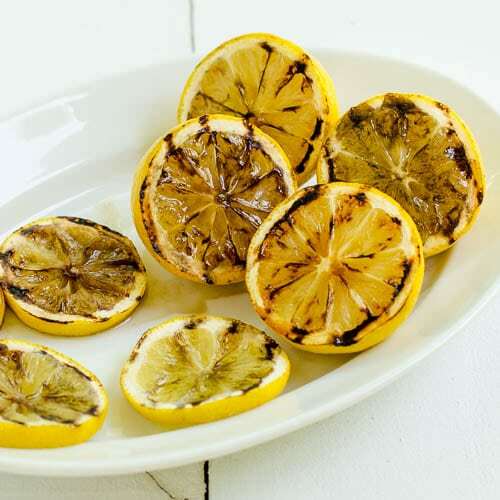 If grilled lemon slices are desired for garnishing, cut a lemon into 1/3-inch slices and brush one side with olive oil. Grill lemons cut side down until charred, about 3 minutes for lemon halves and 1 minute for slices. Squeeze and strain the juice from the lemon halves. Combine 1 1/2 ounces grilled lemon juice, vodka, and cherry syrup in a cocktail shaker. Fill with ice, cover, and shake vigorougly. Pour and strain shaken mixture into a chilled martini glass. Garnish with grilled lemon slices if desired. *The syrup from homemade cherries in syrup is recommended. So interesting! If I saw this on a specialty cocktail menu, I would absolutely order it. I thought you might like it Anita. I LOVE THIS! I am so much more a savory than sweet person, Renee, so adding the smoky charred flavor to a martini is right up my alley. Pinning on my Recipes to Try board! Grilled lemons in a cocktail – I never would have thought of that, but it sounds so delicious! And those grilled lemons are gorgeous! What a fun summer drink!